I was lucky enough to have my card chosen as one of the winners last week at the Catered Crop and as a result I am a guest design team member this week. The theme this week is No Stress to Distress. I decided to use distress ink and markers for my tag. 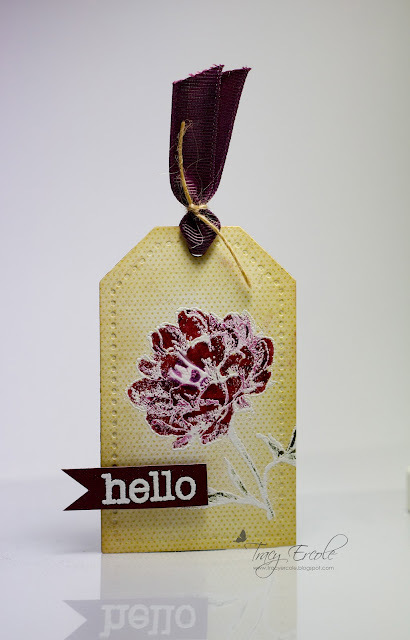 I used Distress Ink in 'antique linen' to distress the edges of the tag and I used a Distress Marker in 'aged mahogany' and 'forest moss' to colour the embossed flower and also to colour the white ribbon. Make sure you stop by the Catered Crop Blog and add your creations. I also going to put this in the latest Hero Arts Clean & Simple Challenge. Beautiful Tracy, love the colors and texture! This is such a pretty tag! the colours look great!